PHNOM PENH (21 Feb 2019) – A scoreless draw was enough for Vietnam to win Group A of the AFF Under-22 LG Cup 2019 as Thailand had to be content with the runners-spot here at the National Olympic Stadium here in Phnom Penh, Cambodia. The eagerly anticipated tie failed to sizzle as both teams chose to fizzle the competition by making a handful of changes to the starting line-up. And in the end, the game did not sparkle enough for a change to the score line although several yellow cards were flashed by Cambodian referee Khoun Virak. Chances were far and in between as both teams were restricted to midfield battle in a match that was played yet again under scorching heat. But it was Vietnam who had the lion’s share of the possession as they pushed Thailand into their own half for much of the exchange. 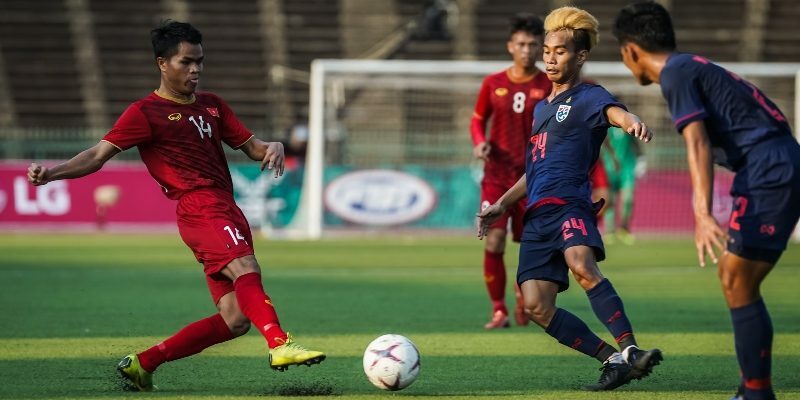 Tong Anh Ty and also Nguyen Hoang Duy all tried from close and from distant but the Thai defence stood firm to ensure the score remained all the way into the second half. Thailand finally woke up in the game late in the match but the effort from Jedsadakorn Kowngan was just wide. IN THE MEANTIME, Timor Leste finished third in Group A following their close 1-0 win over the Philippines in their final game of the group. In the game which had no bearing on the two teams going to the next round of the competition, both Timor Leste and the Philippines put up some attacking football. But in the end, the lone goal in the match came in the 64th minute when Osvaldo Belo ran down the left flank for a cross that saw a fine finish from Mouzinho de Lima.